The RCR24SSA Series remote control receivers are designed to provide a quick and cost effective solution for a variety of wireless remote control relay applications. The receiver includes an external antenna, decoder and six 10-Amp on-board relays. The receiver utilizes spread spectrum technology and offers excellent electromagnetic interference (EMI) tolerance, often found in AC and DC motor applications. 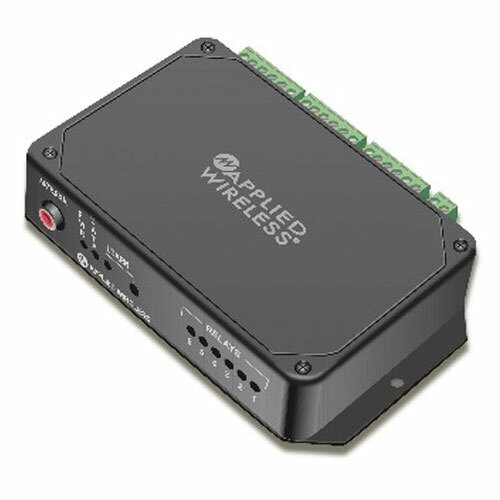 Units are designed to work with Applied Wireless KTX24SSA series 2400 MHz transmitters. These products will not interfere with or be affected by Wifi systems. This is a learning receiver, and can learn up to 60 different transmitters.